MARICOPA, Ariz. (April 22, 2014) Another exciting activity at ACRA was the visit by the Phoenix Chapter of The Ninety-Nines. The Ninety-Nines is an international non-profit organization that was formed to promote the advancement of women in aviation through education, scholarships, and mutual support while sharing a passion for flight. Founded in 1929, the organization was named The Ninety-Nines for its 99 charter members by its first president, Amelia Earhart. Today there are 188 chapters in 35 countries. From left to right are Andy Estes, Desert Rat Aviation; Courtney Smith, Marguerite Bayer, Bonnie Coffey, Pat Ring-Donaldson, Judy Yerian, Ginger Rowley, Jean Knox, and Tim Costello. 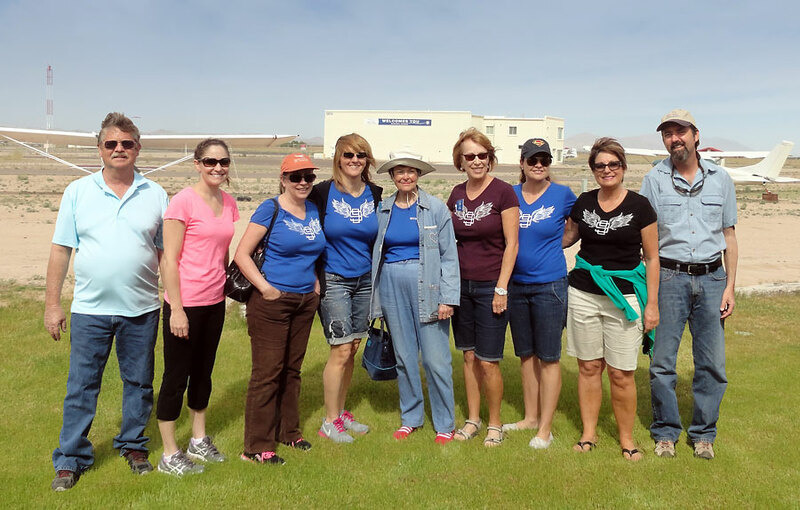 Some of the women pilots from the Phoenix Chapter flew in to plan a future fly-in and spot landing contest with ACRA business neighbors Andy Estes and Kevin Gallagher of Desert Rat Aviation; and Tim Costello, Ak-Chin Regional Airport Manager. 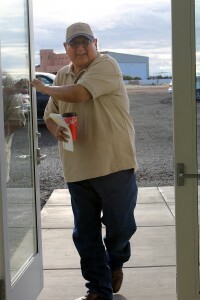 To find out more about The Ninety-Nines, visit http://www.phx99s.org/ or http://www.ninety-nines.org. Watch this website or our Facebook page for announcements about any future events to be scheduled here at the airport. MARICOPA, Ariz. (November 15, 2013) Everyone at the Ak-Chin Regional Airport is flying high since the fuel system was recently reactivated. 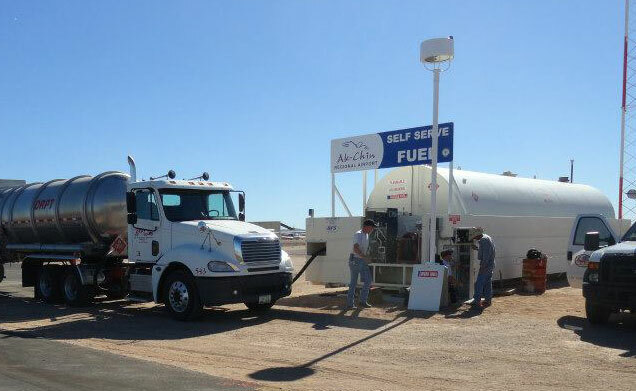 To celebrate, Airport Manager, Tim Costello announced that Avgas 100LL would sell for $5.27/gallon—substantially below all of the closest competitors. The self-service fuel island accepts MasterCard, VISA, Discover and Voyager fuel fleet card. Reactivation of the fuel system is just one of the many improvements to the airport, which is owned by the Ak-Chin Indian Community. 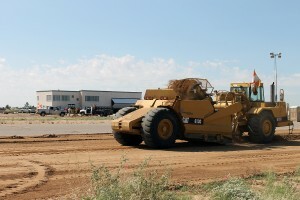 In 2012, renovations to the 4,751 ft. runway and taxiway, and Terminal Building were completed in December. This year, brought a new airport manager and the recent fuel reactivation. Plans are in the works for perimeter fencing, apron (tie-down) expansion, construction of a 10-unit shade hangar and a 24-hour accessible restroom. Runway lighting and an AWOS, automated weather observation system will also be added to increase the airfield utility. So fly on in, gas up and see the improvements we’ve made so far. Then, watch the airport website, follow us on Facebook and Twitter for the latest news and updates. 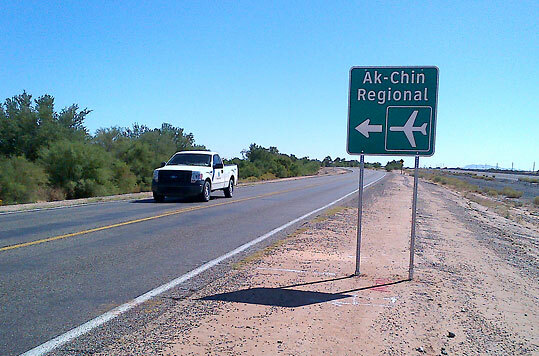 MARICOPA, Ariz. (October 11, 2013) – Thanks to the Pinal County Highway Department, people will know where to turn off the Maricopa-Casa Grande Highway for the Ak-Chin Regional Airport. New directional signs have been installed on both the east-facing and west-facing shoulders just before Russell Road. 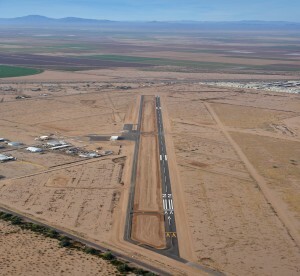 MARICOPA, Ariz. (December 14, 2012) – In December, the Ak-Chin Industrial Park Board hosted the Ak-Chin Regional Airport Open House to show off the first phase of renovations to the airport the Community purchased in 2006. LEFT: Charles Carlyle, Chairman of the Ak-Chin Industrial Park Board, opening the door to the Open House celebration for the Ak-Chin Regional Airport on Friday, December 14. 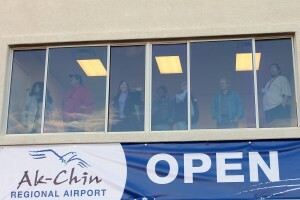 ABOVE RIGHT: Attendees crowding the upstairs window of the FBO building to view the airport’s million dollar improvements. The celebration brought together project participants, adjacent businesses and residents, leadership from neighboring tribes, City of Maricopa, Coolidge and Pinal County officials, and Community staff, elders and other members to survey the airport’s initial million dollar improvements. 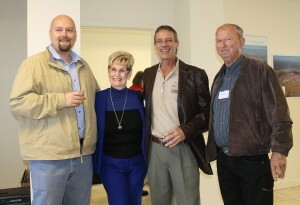 BELOW LEFT: Jason Musselman of Armstrong Consultants; area resident Shirley Ann Hartman; Phil Entz, Acting Manager for Ak-Chin Regional Airport; and local resident Philip (McD) Hartman enjoying their chat about plans for the area. 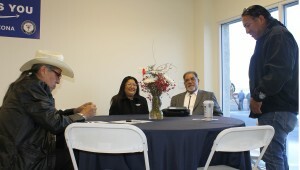 ABOVE RIGHT: Salt River Pima-Maricopa Indian Community Members – (left to right) Council Member Archie Kashoya, President Diane Enos, Council Member Delbert Ray, Sr. and Leonard Rivers. Community Council Chairman, Louis Manuel, Vice-Chair William Antone, plus Council Members, Delia Carlyle and Terry Enos, also joined the festivities and each was presented with an official Ak-Chin Regional Airport polo shirt and cap. BELOW LEFT to RIGHT: “Pilot Captain” Robin Reynolds of Nice Creative welcoming aboard ACIC Council Chairman Louis Manuel, Jr. and Council Vice-Chair William Antone with an official airport polo shirt and cap. 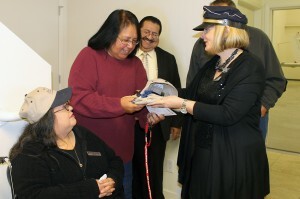 RIGHT: ACIC Council Member, Delia Carlyle (center) admiring the Ak-Chin Regional Airport polo shirt and cap she is receiving from Robin Reynolds of Nice Creative as Maria Hernandez, Vice Chair of the Ak-Chin Industrial Park Board, and Coolidge Vice Mayor, Gilbert Lopez happily appreciate the moment. 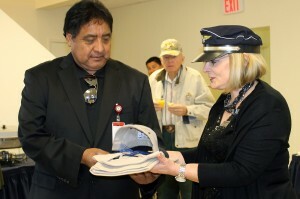 Other local dignitaries, such as City of Maricopa Mayor Christian Price, were also given official airport caps to show appreciation for our communities’ ongoing and mutually cooperative relationship. 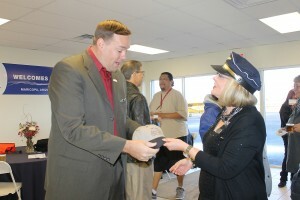 LEFT: City of Maricopa Mayor Christian Price is pleased to receive an official Ak-Chin Regional Airport cap from Robin Reynolds of Nice Creative. While enjoying a variety of brunch items and conversation with peers, attendees were treated to a classic plane exhibit presented by Desert Rat Aviation and Alpha Tech Coatings; drawings for prizes provided by Harrah’s Ak-Chin Casino Resort, Ak-Chin Southern Dunes Golf Club and Ultra-Star Multi-tainment Center at Ak-Chin Circle, and a spontaneous formation flight demo provided by Andy Estes of Desert Rat Aviation and George Hoover of Coulee Air Services and Cub Driving. RIGHT: Angie Groeneveld, Harrah’s Ak-Chin Hotel Food and Beverage Director sharing a warm drink with Gabriela and Leon Potter, City of Maricopa Councilmember. 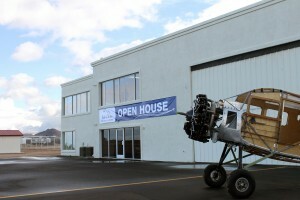 BELOW: A Boeing Steerman WWII trainer that is in the process of restoration was one of the featured classic aircraft provided by Desert Rat Aviation. 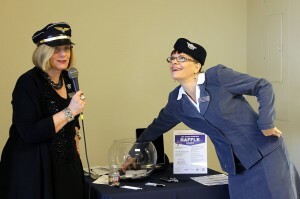 BELOW: Robin Reynolds and Kim Dahle of Nice Creative announcing another raffle winner. 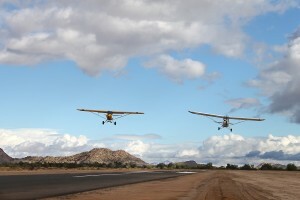 LEFT: Andy Estes of Desert Rat Aviation and George Hoover of Coulee Air Services and Cub Driving provided a spontaneous formation flight demo. 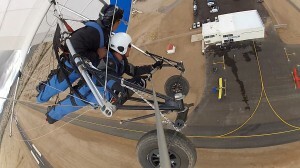 In addition, two daring Community members, former Miss Ak-Chin, Alyssa Garcia, and Council and Industrial Park Board Member, Terry Enos volunteered to participate in a tandem hang-gliding ride offered by Sonora Wings Hang Gliding, which literally gave them a bird’s eye view of the airport and the surrounding area. LEFT: Mark Knight of Sonora Wings Hang Gliding giving Terry Enos a bird’s eye view of the airport’s renovations. 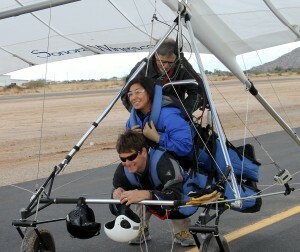 BELOW LEFT: Alyssa Garcia, 2012 Miss Ak-Chin, is readied for her hang gliding flight. 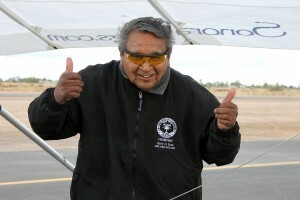 ABOVE RIGHT: Terry Enos gives a “thumbs up” after Sonora Wings Hang Gliding lands him safely back to earth. For more than a year, the Industrial Park Board has worked with Armstrong Consultants of Grand Junction, Colorado, to develop the master plan and oversee the engineering for the project which was implemented by AJP Electric and Pioneer Builders, both of Phoenix. LEFT: Armstrong Consultants, who specialize in airport planning, engineering and construction administration, supervising the airport renovation. 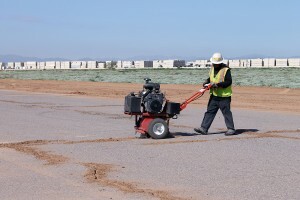 While Pioneer handled construction of the housing for the electrical infrastructure, AJP completed the resurfacing of the runway and taxiway, which included crack repairs, re-sealing, repainting thresholds, runway numbering, and taxiway striping. They also installed new visual aids for pilots which consisted of a new beacon, segmented circle, and wind cone. 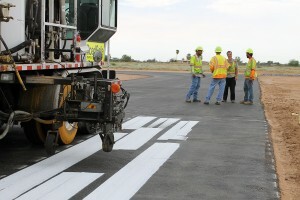 ABOVE LEFT: AJP Electric resurfacing the runway and taxiway, including crack repair and re-sealing. ABOVE RIGHT: Pioneer Builders constructed the housing for the electrical infrastructure. 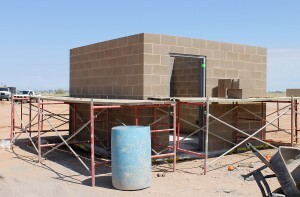 The Board also supervised the work of Marbecc Custom Designs of Fountain Hills, who renovated the interior of the FBO Building to add a new entryway, stairwell, walls, flooring, bathroom, and refinished and repainted both the interior and exterior. BELOW: Marbecc Custom Designs working on the interior upgrades at the FBO building. Before the Open House, AJP was contracted again to finish the final weed removal and grading of the runway safety areas. We are excited that so many of you got on board as this new venture took off. Future plans now include getting new runway lighting installed, adding an Airport Manager on staff, and reactivating the fuel system. Watch for more news and updates as we launch our new Airport website at www.akchinairport.com or connect with us on https://www.facebook.com/AkChinRegionalAirport or Twitter https://twitter.com/akchinairport. The first phase of renovation at the Ak-Chin Regional Airport is now complete.